According to the theory of global warming, this is the kind of thing that shouldn’t happen. 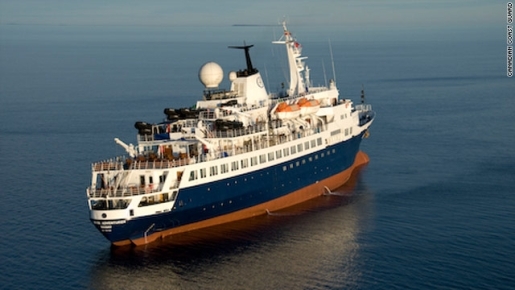 The water levels are supposed to go up, not down, so cruise ships like the Clipper Adventurer aren’t supposed to run aground on unmapped rocks and not be able to get free from them when traveling through the Arctic Ocean. However, that’s exactly what happened when a cruise ship got stranded in the Arctic. Fortunately for all, Canadian officials are ready to help, and the tiny Arctic town of Kugluktuk is about to get 128 extra citizens on a temporary basis (at least until arrangements can be made to fly the passengers to Edmonton). “They are in the midst of completing the operation of ferrying the passengers off,” said Theresa Nichols, spokeswoman for the Canadian Coast Guard. “That operation should be just about finished.” Meanwhile, according to the cruise ship company, Adventure Canada, “Weather remains favorable as passengers continue to enjoy onboard programming and hospitality.” That’s what you call putting a positive spin on a bad situation! Now, here are the hard questions: How do you get the ship moved off the rocks without damaging it? Also, how did nobody know there were rocks there? Every danger in the ocean is mapped!